It's Hip 2 Serve! 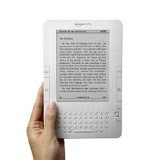 : Kindle reduced to $299 on Amazon! For those of you that have been debating whether to purchase a Kindle now is the time! Amazon just reduced the price to $299 (I purchased it just several weeks ago for $359-DARN!) and it qualifies for FREE Super Saver Shipping! For more information about the product and/or to order it, click here. Happy shopping and reading!